Cherie Blair, the wife of former British prime minister Tony Blair, has lobbied Hillary Clinton on behalf of the crown prince of Qatar, new private emails released by the former US secretary of state show, media reports in London said. In a 2010 email marked confidential, Blair sought to arrange a meeting between Clinton and Qatar’s young crown prince, Sheikh Tamim Bin Hamad Al Thani, The Guardian reports. It emerged that Blair had brokered a “woman to woman” meeting between Clinton and Sheikha Mozah, the crown prince’s mother, the paper reports. The crown prince, Blair explained, had been appointed head of Qatar’s national food security program. “He is aware that food security is an issue you are majoring on and would love to meet you in person to discuss this and to explore potential partnership issues between US and Qatar,” she wrote. 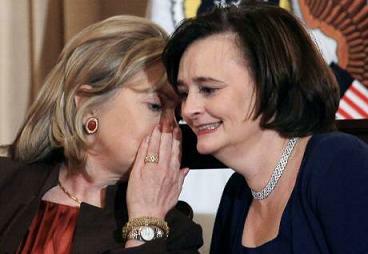 (Pictured, Blair with Hillary Clinton, left, at the State Department on October 7, 2010 in Washington). Qatar’s conservative ruling family owns London properties including the Shard, Harrods and the capital’s largest private house, 1,2,3 Cornwall Terrace, next to Regent’s Park. Sheikha Mozah’s husband is Sheikh Hamad bin Khalifa al-Thani, who was emir from 1995 to 2013 and is worth an estimated £1.5bn, the Guardian reports. Blair has characterised her confidential messages to Clinton as harmless. She says she got to know Sheikha Mozah through her work with the disability charity Scope, of which she is a patron. She visited Qatar several times as its representative, and got to know the emir’s wife because of their shared interest in disability. At the time, Tony Blair had left Downing Street and was working as Middle East envoy on behalf of the UN, EU and Russia. It would have been more usual to arrange an appointment with Clinton via regular diplomatic channels, such as the US embassy in Qatar. There was no immediate comment from Cherie Blair’s office, the Guardian reports.